Kodabar DayZ blog: So what's the deal with Kim Jong-un then? Since the death of Kim Jong-Il, a surprising amount of people have asked me what I think of the situation in North Korea. This is a bit odd as I'm not from North Korea and I'm not terribly familiar with the political situation in the country. I do take a keen interest in the DPRK and I have been there - I even went to Kim Jong-Il's birthday party (although he wasn't there and it's not like we were mates or anything). But given the standard of punditry and expertise on display on the various news programmes, it appears that nobody really knows a damn thing about what goes on over there. Mind you, that doesn't stop various guests collecting appearance fees and burbling away endlessly like they actually have a clue. North Korea is a bit of an odd country and a lot of what's said about it is nonsense or difficult to understand without knowledge of their cultural context. There's little doubt that life there isn't exactly great for a lot of people and that their respect for human rights isn't high, but why do our news organisations spend so much time fretting about the country when we barely hear a word about similar states like Myanmar (Burma) or Indonesia? If there's one thing that defines the North Koreans, it's their own particular brand of communism: Juche.It was Kim Il-Sung (Kim Jong-Il's dead dad) who came up with the Juche Idea (well, officially at least) and defined it as independence from other states, a strong military and relying on national resources. Basically, it preaches self-reliance above all else. At the end of the Korean War, this was quite an appealing concept as it was the actions of other countries (most notably the US and the Soviet Union) that had brought about the circumstances that started the war. When China got involved, America threatened to use nuclear weapons and carried out a series of tests of low-yield nuclear device tests during the conflict. So the idea of North Korea cutting themselves off from the influence of foreign powers was welcomed there in the aftermath of that superpower faceoff. For a while it worked pretty well and North Korea advanced quickly, to the point where they sent food aid to help the struggling South. Kim Il-Sung was seen as a hero and was increasingly portrayed as a great leader who had defeated the superpowers and reconstructed a country ravaged in a proxy war. Initially the hero worship was at least partially justified, but soon grew into a personality cult with increasingly outlandish achievements and abilities attributed to Kim Il-Sung who started to be referred to as the "Great Leader". Things started to plateau in the mid 1960s and Kim tightened his political control of the country in the face of increasing opposition. Although China had been a fairly enthusiastic friend to North Korea, it was around this time that China began to feel that Kim and his country had little to offer and so scaled back their trade and political links. 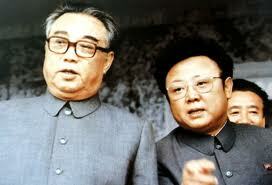 In 1980, Kim announced that his son, Kim Jong-Il, would become his successor. It was a further 14 years before he died, so Kim junior was thoroughly groomed to take over and became well-established after being given a series of high ranking posts in the military, communist party and government. As he began to take over more and more leadership responsibility from his father, things really started to go wrong in North Korea. Mismanagement of land resources worsened the effects of a series of natural disasters in the 1990s and the collapse of the Soviet Union meant that there was no support from former Eastern Bloc countries leading to famine and mass starvation. Oops. Although the disasters ended, the country never really recovered and a subsequent series of floods in 2007 brought back food shortages so bad that North Korea had to formally request help from the Red Cross. In the late 1990s, Kim Jong-Il started actively promoting his son, Kim Jong-Nam, as his successor, but this started to go wrong when he turned out to be a bit thick. 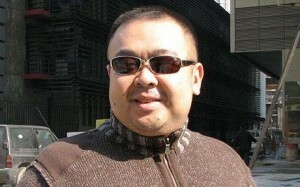 In 2001, he was caught attempting to enter Japan with a false passport, claiming he was going to visit Tokyo Disneyland. This was massively embarrassing and Kim Jong-Il had to cancel a visit to China. Kim Jong-Nam fell further out of favour in the next few years and it soon became apparent that his father was looking to his other sons to succeed him. At one point, Kim Jong-Chul (yes, they're all called King Jong-something) looked to be likely after it was rumoured that the military supported him. This is the main problem with news coverage of Korea: very little is known about what goes on and most information comes from rumours repeated by defectors or from watching North Korean TV over the border in the South or selected rebroadcasts in Japan. 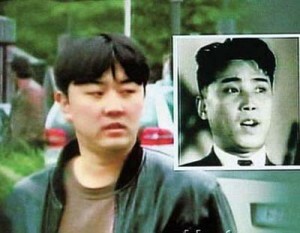 In 2009, Kim senior started shopping around the idea that Kim Jong-Un was to be his successor. There were a few problems with this, not least his age (mid-twenties). 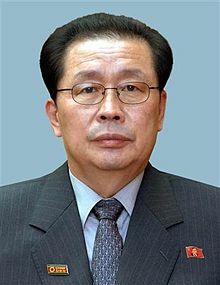 The young Kim appeared on the ballot for the Supreme People's Assembly (their parliament) and was appointed to the National Defence Commission. The latter was interesting as his father's actual job was chairman of the defence commission (for some daft reason, Kim Il-Sung didn't stop being president just because he was dead). Embassy staff were asked to swear allegiance to Kim junior and he secretly travelled to China, probably to obtain the endorsement of their government. 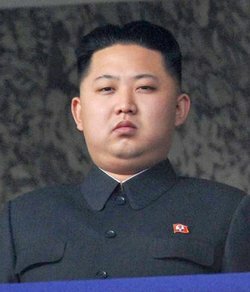 Kim Jong-Un was later given a military rank in a probable effort to gain the support of the army. He also started to appear on television in what was clearly an attempt to familiarise the citizenry with him. It all went massively wrong when Kim Jong-Il died just a few days ago. Well, his death was announced, but it's more likely that he kicked the bucket a bit before that. The official story was that Kim died when travelling the country on his personal train, but satellite pictures reveal that the train hasn't moved in weeks. Chances are that it was felt necessary to have a death scenario that tied in with Kim's public image of tireless micro-management and that support for his successor be affirmed. The succession is far from settled even though Kim Jong-Un has been formally named "supreme leader" and China has publicly recognised that position. 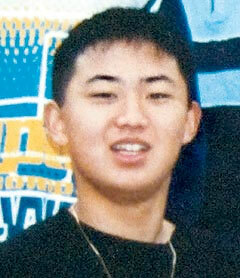 Kim Jong-Il just didn't have enough time to confirm his son's status and show him the ropes. So who's really running North Korea? It's thought by some that Jang Sung-Taek is in charge at the moment having been the second in command (Vice-Chairman of the National Defence Commission) and he just happens to be Kim Jong-Il's brother in law. A couple of days ago, he was seen dressed in a general's uniform, suggesting that he's been given an army rank to give him some pull with the military. Nothing is really known about him and any suggestion that he's in charge is just speculation. Just as many North Korea "experts" are queueing up to say that his wife, Kim Kyong-Hui, is the one in charge after spending years as Kim Jong-Il's aide and being promoted to the same military rank (and on the same day) as Kim Jong-Un. So what's going to happen in North Korea? Is Kim Jong-Un really going to be the leader or will it be his uncle actually running things with a possible view to letting the youngster assume command in the long term? Will North Korea soften its hardline stance and start to gradually reform in the way that China did thirty years ago? Will re-unification with South Korea ever be possible? Could the United States provoke North Korea into a military stand-off? I dunno. And it's not just me. No one has the slightest clue what is happening in North Korea and they have no idea what's coming next. Although the news confidently reports that Kim Jong-Un is 28 years old, in reality we just don't know. It's thought that he was born sometime in 1983 or 1984, but no one knows for sure. No one had even seen a photograph of him until two years ago. Bear that in mind next time you see some pundit on a news programme confidently predicting what will happen over there. About the only country with any kind of influence over North Korea is China. America has tried sanctions and threats, but has failed. Masses of US troops are still stationed on the border with South Korea (the ironically named Demilitarised Zone or DMZ). It's often mentioned that North Korea has nuclear missiles and that's true, but it only has a few and their missile systems haven't been terribly successful. One can't help but wonder if American wouldn't already have found a reason to have intervened militarily in North Korea if they didn't have nukes. On the day that Kim Jong-Il's death was announced, a missile test was conducted. It's not clear what the purpose of this was. It may have been to signal to the US that, just because the country's leadership was in flux, it didn't mean there weren't fingers on triggers just in case the Americans got any clever ideas. Or it may even have been to suggest that the military were capable of acting autonomously without explicit authorisation from Kim Jong-Un. Goodness only knows. And that's why it's going to be very interesting to watch what's happening in North Korea over the coming months and years. No one knows anything about what's happening there right now and any suggestions about what's going to happen in the future are just guesses. One thing's certain though - it won't be boring. Should be interesting to watch what happens when China gets into a bit of bother with it's economy (well - I have heard conflicting predictions that maybe it's only the "young Chinese stockbroker millionaires" will be in trouble since all they've ever known is a Bull market - i.e. http://dailyreckoning.com/china-bull-market-or-bubble-the-story-continues/ ). Will China be as keen to help? Although if China has problems then so will the world! Well, that's something that's certainly of interest. Inflation's been running quite high in China and whilst it's down to 4.2% after three years of trying, the Chinese government hasn't yet met any of its inflation targets. But there's still a long way to go before China's economy can be seen as being in trouble.